DataVisor’s Unsupervised Machine Learning Engine analyzes all accounts and events simultaneously, allowing it to detect the hidden connections between hijacked accounts, even when each account is not suspicious in isolation. This allows it to detect the accounts without training data or labels, even as attackers use sophisticated and evolving tactics to evade detection. Fraudsters use armies of bots to test millions of stolen credentials or access accounts with commonly-used passwords. Fraudsters utilize proxies, VPNs, or cloud-hosting services to evade IP blacklists and appear as multiple legitimate users. Modern account-takeover attacks are coordinated and distributed, using stolen credentials and detection-evasion tactics. 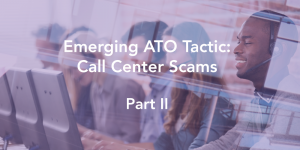 Because traditional fraud solutions only analyze each account in isolation, they are often unable to effectively detect these attacks. DataVisor’s Unsupervised Machine Learning Engine analyzes all user accounts and events at the same time, uncovering the hidden connections between them. This allows it to detect stolen accounts without training data or labels, even if there is nothing suspicious about the account in isolation. Detect account takeover at login before any downstream damage is done. Catch entire rings of hijacked accounts without impacting good users.